Home > Blog > Strategy > How Should I Market My Company Online? How Should I Market My Company Online? Marketing is effective online but not every online marketing channel is right for everyone. When considering your marketing efforts, you have to be honest with yourself. Don’t get seduced by hip marketing channels or your own ego. Make an honest assessment of your customers and business and pick the right solution. This will save you time and money. This will start to generate results quicker, too. Are people looking for what I have to offer? How do you know if someone is looking for you online? You can know this through a “keyword research.” This is the process of brainstorming phrases for which potential customers might be searching and then collecting the data to determine which phrase is more common. There are several ways you can do keyword research. To identify which marketing channel you should use. There’s even a simple way. The point is, don’t just pick your marketing solution on fads or ego. Where are your customers? That’s where you should be marketing. If customers are looking for you, you should consider Search Marketing. Search marketing is the practice of connecting people with the solutions they seek. There are two ways to engage in search marketing: SEO and PPC. I’ll talk more about these, below, as well as how to chose which one is best for you. 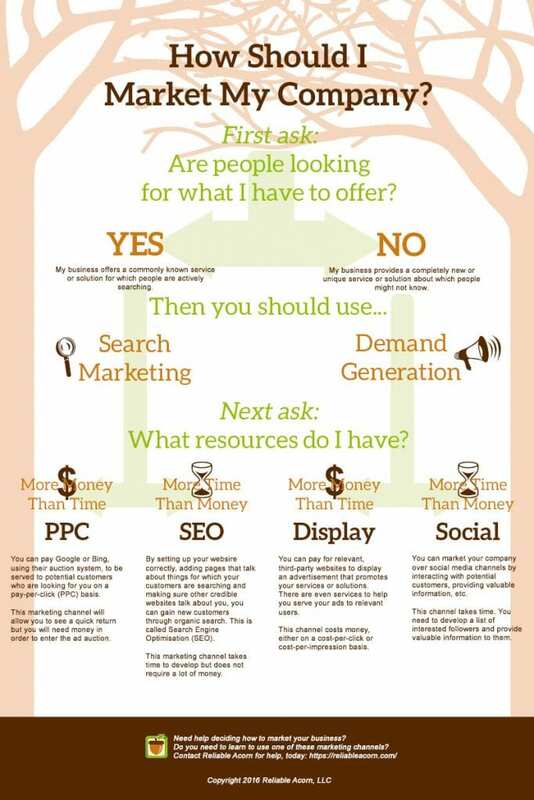 If customer aren’t looking for you, or you are unsure, you should consider Demand Generation. It might be that your company has a unique solution that nobody has considered before. That’s great! Choose marketing efforts that introduces your company them. There are two basic ways to do Demand Generation online: Display Advertising or Social Media. I’ll help you decide which one of these is best, by asking a second question. Even the biggest companies have limited resources. The two limitations every company comes up to is either time or money. Which of these is your limitation? If you know people are searching for your solutions, and you have the money, you should consider Paid Search (PPC). This is an auction, held by the search engines, where companies bid to show up in the search results. If you win the auction, you only pay if someone clicks on your ad. This is why it’s called pay-per-click (PPC) or some call it cost-per-click (CPC) marketing. While this channel costs money, it can start to deliver results fast. You should start to see results within a month of starting your PPC campaign. Can the search engines crawl your website? This is Technical SEO. It can involve making code changes to your website so the search engines can read your site. Most modern CMSes do a decent job with this. Most developers know how to do most of this. However, even the best of these sometimes overlook things. Does your website use the same words as your customers, as they look for you? This is about content. Words are important. Any SEO campaign has an insatiable need for more content. Do other websites consider your site an authoritative source of information? This is Link Building. While this might be the hardest part of any SEO campaign, it is still the most important. SEO takes time. It takes time for the search engines to review your site. Once they’ve reviewed it, they compare your web page to other, relevant pages. This is not a quick marketing effort. It can take a three to six months before you start to see the effect of an SEO campaign. SEO also takes time to learn. Once you get the basics down, you’ll also need to spend time keeping up with changes in the algorithms. Don’t forget to keep up with changes in search technology, too. If you have a unique solution for which people are not searching, and have the money, you should try Display Marketing. With this channel you show ads to potential customers on third party websites. There are several services that can help you with this (including Google AdWords). To show your ad, of course, you need to pay. Sometimes you’ll pay on a cost-per-impression (CPM) model. Other platforms allow you to pay on a cost-per click basis, like a PPC campaign. Not only do you need to pay for engagement, you’ll need to invest in assets to display. That means you’ll need to pay a designer to create a series of ads, each one in a variety of sizes. Even though you are paying money for this channel, it is not quick. Creating demand for anything will take time. Choose a social media platform on which your customers take part. You can choose this based on demographics or by your industry. Take some time to find out where your customers spend their time- and be there with them. Develop a following of relevant people. Without followers, nobody will hear you. You don’t just want anybody to follow you. You want potential customers to follow you. Encourage engagement with those people. Don’t just talk about your company or your services. Provide something valuable to people in your target industry. Let them know you care about their succes. Don’t overlook the value of giving things for free- whether knowledge or tools to help them. As you can tell, this will take time. When I say a solution takes time or money, I’m oversimplifying. Channels that take time, will cost money. Channels that cost money will take a little time. For example: if you are running a PPC campaign, you need to look into it at least once a week. From there you’ll need to make tweaks and optimizations to get more from your campaign. At the same time, if you’re running a Social Media campaign you’ll need to spend some money. That might go towards tools, to help you save time. It might go to assets such as images or even copywriting. This is also why I have a business. Companies pay me in exchange for time. As a consultant, some companies pay me to help them be more efficient with their time and money. If you have a little more time or a little more money, why not do a couple things at a time? When you combine some of these efforts, you’ll get a little more out of each. Whatever You Do, Measure It! No matter which solution you choose, you must be able to measure it. If you can’t measure your results, how do you know if it works? What should you measure? That’s easy: what makes you money? Are you trying to generate leads? Track them by their marketing channel. Are you selling products? You need to know which channel generated the most sales. Sure, you need to keep an eye on other metrics but the most important ones are those closest to your revenue. That’s how you’ll know if the time and money behind your marketing effort is paying off. That’s how you’ll know you chose the right marketing channel.